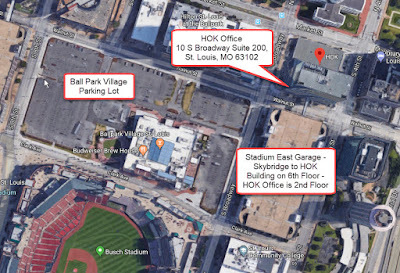 Come join us for the first St. Louis Revit User Group Event of 2018!! Our topic for this event is Visualization. Everything from simple Graphic Override techniques in Revit to a fully developed VR/AR model using a game engine. We are going to discuss the gamut of possibilities for visualization of models created in Revit. We plan to break these techniques down into a menu of approaches based on the effort and expertise required to provide different levels of visualization for your clients. The event will be on Thursday, February 8th 2018, starting at 6 PM and ending at 9 PM. The venue for this event is the HOK, St. Louis Office at 10 South Broadway (Suite 200), St. Louis, 63102. See below for parking/access information. Update: Members from the BILT NA Conference Committee will be on hand at our event to answer any questions about the upcoming BILT NA Conference right here in St. Louis in August! Click here for details! Come join us as we pull out our VR gear, and explore the options available for visualization. We will have several stations setup for some hands on as well. Make sure to RSVP if you plan to attend, there should be quite a crowd!